Not gonna lie, I've attempted to write this post about six times and just wasn't happy with it. not sure why I just couldn't get into the swing of it. However, time is ticking and I want to have my reflection of 2017 done and dusted so I can get stuck into the new year. Going to be honest with you, I spent Jan 2017 feeling more miserable than ever before. Thanks to some mystery health problem (which has improved greatly but I still don't know what it is) I spent the month in a lot of pain, anxious all of the time, and felt helpless in the situation. I remember being very happy when it snowed one day but that was about it. Not my finest hour. February was mixed. To start with, I turned 21! My birthday was actually fab, I got to celebrate with my work chums and all my faves and it really lifted me out of the doom and gloom that was January. I drunk so much prosecco and put on my dancing shoes to party, and party hard. I spent most of the month around my birthday trying to stay positive and not let my anxiety get the best of me. I had this serious fear of doctors, hospitals, and dentists (which I've since now overcome a lot thanks to a dozen or so appointments) and this made everything ten times worse. I was scared of whatever was wrong with me, and I was scared of anything at all to do with it. A definite turning point happened in March. After a bit of a scary, but thankfully super fast dental procedure I felt like I'd finally tackled my fear of dentists. So that left me feeling pretty cool. I also had a lot of fun things planned in March, including a trip around London visiting everywhere that appears on a Monopoly board (super fun, you should try it). A visit to Northampton, where I partied with my besties to the best old tunes ever. Plus, a night out bowling in London. Things were on the up! March was also the time I decided to bite the bullet and buy myself a bullet journal. This in itself gave me a huge distraction and helped me deal with my anxiety over my health a bit, but it's also completely changed how I organize my life. April was jam-packed with fun stuff. I felt better than ever and on top form. I was truly happy this month. 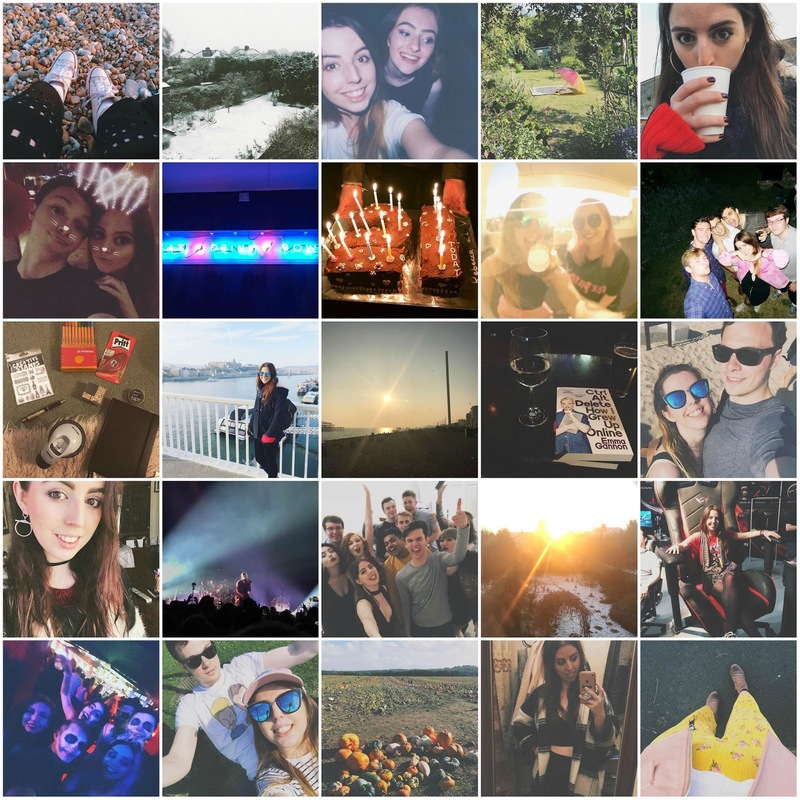 I managed to fit a lot in too, with a Topshop personal experience with my bestie, Lucy, a weekend down in Brighton with Jim, many cocktails at every opportunity, and Jim's 21st. We threw a top party and I danced the night away and cleaned up a lot for him too so there wasn't too much of a mess the following morning! In May I put my blogging hat back on after many months of neglect and got back in the swing of things. I met Emma Gannon at one of her live Ctrl Alt Delete podcast recordings which motivated me so much. I also spent a lot of time outdoors enjoying the surprisingly hot weather we had. May was a sunny month and I've never listened to so many inspiring podcast episodes ever. (Post coming on my faves in the near future). I also went back up to Northampton to party again (sensing a theme here?) as my friend was graduating uni there. I relaunched my blog in June! After needing a big shakeup with my content I got stuck in and blogged a lot - perhaps in hindsight a little too much too quickly because I quickly got burnout, but hey ho it's okay because I'm back on it now. June was even sunnier than May and I made sure to spend evenings out drinking cider whenever possible, as well as relaxing in my garden reading. It was bliss, and just writing this makes me long for those hazy summer afternoons. I also packed in three trips to shows in June. I saw Imagine Dragons for the second time, at The Roundhouse in Camden, got to see the actual, real-life David Tennant in Don Juan in Soho (absolutely fantastic), and I saw Miranda in Annie. I'd booked all of these, except Imagine Dragons, really in advance so it was great they all ended up being within a short time of one another. August seemed to be full of birthdays. I went to a trampolining park which was pretty cool, a gaming pub which I'd love to go back to, a couple fab house parties, and got to see my fave gal, my cousin! I also got to see the amazing Kate Nash in concert with one of my faves and she was FAB. I didn't think I'd get the chance to see her live anytime soon but I did and she sang all her old hits. It was one of the best concerts I'll probably ever go to. I also travelled up to Birmingham for a weekend to party it up and visit one of my bestie's new house - it was on this visit a marvellous Snapchat video of me was born - never to be seen online though haha. Finally, to end August I saw Andrew Scott in Hamlet on the West End. I'd never actually sat and watch any version of Hamlet all the way through before but I really enjoyed it. This production had a very modern twist spun on it and in parts is was quite scary - very thrilling. September was a bit up and down, my mystery health problem reared its ugly head again and I was quite poorly with a stomach bug and then seemed to have mini flu. Woo. I did get to spend the day in Brighton though with a couple of work buddies and to my surprise, the sun was shining and it was warm! Towards the end of the month I travelled up to Birmingham again, but this time to go to the gaming conference EGX. This was pretty cool as I'd never been before and I think I'd like to go again this year. We stayed the night in a hotel and got very merry. After recovering from my few bouts of feeling under the weather, I got into the spirit of Halloween and went pumpkin picking for the first time ever. I had such fun, although must remember next year not to pick so many as it took us a long time to get through them all! I also dressed up for Halloween and went to Propaganda in London for a wild night out. We stayed til the very end, the tunes were amazing and the company was perfect. In November I stepped up my gym routine and felt like results were really starting to show. I went to a couple house parties this month and had a great laugh, as well as buying my fave coat ever. It's like a blanket and I've worn it every day possible since. I tried to fit in a couple of more chilled weekends here and there during this month before gearing myself up for the festive celebrations to come. December was a complete whirlwind and I honestly can't believe how quickly it came and went. At the start of the month, I jetted off to Budapest for a long weekend and was pleasantly surprised by how much I liked it there. I didn't really have expectations for this trip (it was booked spontaneously) but had a blast! I've never been colder but I had such a laugh. You can read all about it here. After this much-needed break I got back into my blogging groove (again lol) and am really happy with the content I've got in the works right now. I had a record-breaking seven Christmas dinners I think, so I'm pretty done with roasts for a while! During December I also went to a couple of festive house parties, played a lot of board games, and spent a lot of quality time with my best chums. I ended the year feeling pretty high on life, I just hope that it all continues throughout 2018 because I’ve got some serious plans I want to make happen!